Horseshoeing school owner Reggie Kester of Ardmore, Oklahoma has died. 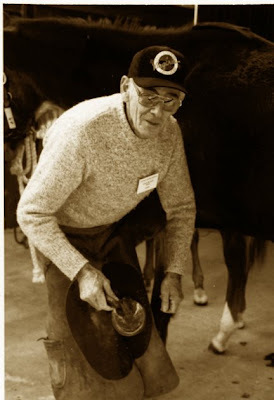 Reggie owned Oklahoma State Horseshoeing School and has taught thousands of people to trim and shoe horses. 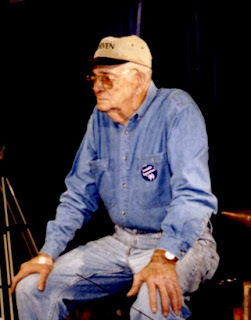 His school has always been one of the most popular farrier schools in the United States and Reggie was a leader of independent farrier educators. He called a meeting in 2005 that lead to the establishment of the American Farrier Educators Council; he was elected the first president. Reggie had cancer and had been hospitalized since Thanksgiving with complications of pneumonia. I thoroughly enjoyed knowing Reggie Kester and enjoyed working with him in the old days of the informal "farrier educators" group meetings facilitated by GE Tools' Beth Garner. That group grew into the Registry of Professional Farrier Educators (RPFE), which I believe no longer exists. Reggie called a crisis meeting of private horseshoeing school owners in Oklahoma City in 2005 in reaction to a perceived threat or intervention on the ability of private schools to continue to run their businesses, which lead to the formation of the AFEC. Reggie was a "can do" man who I think of as having one foot in the past and one in the future, while looking the present right in the eye. He started his school in 1975, just before the beginning of the boom in private horseshoeing schools, and his school was very well known. He believed in what he was doing, he believed in being involved in the bigger farrier industry, and he and his family are friendly, genuine ambassadors for farriery. They have launched the careers and advanced the skills of so many people, but they have also enriched many more lives with their enthusiasism and warmth, including mine. Update: A funeral is planned for Friday, January 2nd, handled by the Craddock Funeral Home in Ardmore, where a complete obituary has been posted about Reggie. You can order flowers from the Yellow Rose Florist in Ardmore: 580 226 5116. Choose Your Racing Shoes: Last Days to Wear Toe Grabs Before 2009 Rule Changes! A major fashion change is due on most Thoroughbred racetracks on January 1, when the majority of racing states will change over to the outlawing of most toe grabs on the front shoes of raceplates. The January 1st deadline is in compliance with a ruling by the American Graded States Committee that states would not qualify for graded stakes status unless the rule was adopted. It is feasible that some states may delay implementing the rule if the state does not have many graded stakes, or if the graded races are run later in the year. 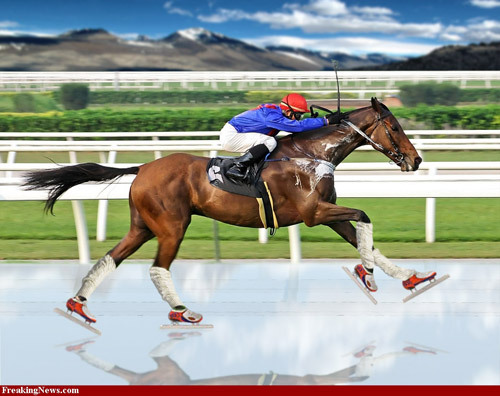 In California, a rule began in February 2006 banning toe grabs higher than 4mm on the front shoes of Thoroughbred racehorses only; racing Quarter horses and mules do not run under that particular rule in California. At this point, it looks like California will hold with their original 4 mm rule, which may move it from one of the first to restrict toe grabs to being one of the most lenient. At CDI tracks, owned by Churchill Downs, a new rule enacted this fall reads: “Front horse shoes which have toe grabs greater than two millimeters shall be prohibited from racing or training on all racing surfaces at all Churchill Downs Incorporated racetracks. This includes but is not limited to the following: toe grabs, bends, jar calks, stickers and any other traction device worn on the front shoes of Thoroughbred horses. CDI tracks include Churchill Downs in Kentucky, Arlington Park in Illinois, Calder Race Course in Florida, and Fair Grounds Race Course in Louisiana. The CDI rule is an example of what is known as a "house rule", meaning that individual racetracks can create specific rules for horseshoes that are more strict than the rules of the state where the track is located. Horses training at Keeneland to race at Churchill had better check their shoes at the gate when they get back to Lexington, or else make an appointment with the horseshoer for race day in Louisville. At the Penn National group of tracks, a house rule went into effect in October, stating "All Thoroughbreds competing or training at Penn National Gaming owned racetracks will not be permitted to use toe grabs in excess of two (2) millimeters in height. The use of bends, jar caulks, stickers or any other traction device on front shoes for racing or training will also be prohibited." Penn National in Pennsylvania and Charles Town in West Virginia are impacted by this rule. Racehorse trainers will need to be conscious of both state and "house" rules at different tracks, and horseshoers will need to be prepared, although publicity about the rule changes has been widespread. Horses that ship between tracks may need to be reshod in some cases. Shippers should be happy about the traction ban, since toe grabs and other protuberances rip up mats on loading ramps and in van stalls. Some questions about special designs of shoes may be decided by stewards or horseshoe inspectors, depending on how each track or state designates the decision-making process surrounding shoes. As you can see, some tracks will enforce the ban on the hind shoes as well as the fronts; some won't. Some allow two millimeters, some don't. The strictest rules of all, at Keeneland and Turfway, allow no traction at all on any feet. While the arguments over toe grabs seem to have died down, the winter months are when trainers would naturally turn to traction devices, depending on the type of conditions at a training track or on the main track where the horse will be racing. 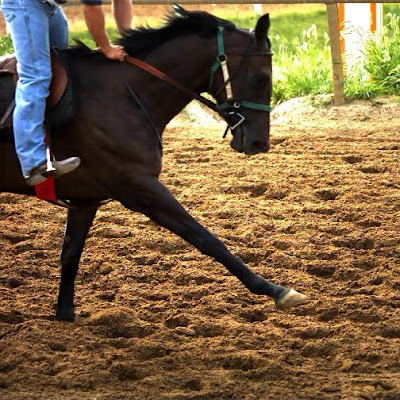 While they may assert that they are using shoes to help the horse "get hold of the track", many feel that the safety of the rider is more assured if the horse is less likely to slip, especially around turns. Others feel that toe grabs are more dangerous to jockeys and exercise riders, in the event of a fall. Thoro'bred's new three-dimensional Turbo shoe is an interesting innovation, since it provides traction on the sidewall of the shoe, not directly on the ground surface and does not increase the angle of the hoof. The horseshoe is no longer a two-dimensional object. If you are working with racehorses and are uncertain of rules, think of toe grabs as the equivalent of medication, and don't take someone else's word for what the rules are at a given track. Check with the racing secretary's office. In memory of farrier Edgar "Eddie" Watson, a service has been planned for Saturday, January 3rd, at 11:00 a.m. at Preddys Funeral Home in Gordonsville, Virginia. This is now official. Gordonsville is outside Charlottesville, which in turn is between Richmond and Washington, DC. A web-based "guest book" has been created for anyone who wishes to leave a message for Mr. Watson's family. Click here to go to the guest book. As one entry says, "We will miss Eddie making everything look easy." 12/28 Update: An official, more detailed obituary has now been published in the Charlottesville newspaper, the Daily Progress. Click here to read it, with details of donations. 12/29 Update: Some of the horse owners whose horses benefited from Mr. Watson's expert care have created a forum topic about him at the Chronicle of the Horse web site. So you think woman farriers are something new? How about Olive Oyl for a role model? In November, Kwantlen Polytechnic University farrier faculty member Gerard Laverty became the only farrier in Canada, and joined a handful of farriers in North America, to officially receive an elite designation as an Associate of the Worshipful Company of Farriers (WCF) of London, England. A native of Northern Ireland, Gerard has represented Canada in international farrier competition. He previously earned the journeyman and therapeutic endorsement certification levels through the American Farrier's Association. "I didn't know what I was getting into," Gerard said recently. "The AW (examination) requires a horse to be shod with therapeutic shoes and you produce a specimen shoe. It's more modern than the AFA's TE test. You have an hour to repair a hoof crack, or open an abscess, or do a resection. They tell you which to do. And for the specimen, they give you three pages of shoes that you might be asked to make." He had to take the practical test twice, making four long trips from Vancouver to London. Before taking the test, he spent time working in Scotland with Allan Ferrie FWCF for coaching, and with Gary Darlow in England. His individual test called for him to shoe the front end of a horse with a pair of straight bar shoes. The frog could not touch the bar when the foot was loaded and the solar border had to be relieved. For the modern materials portion, he had to create a toe extension and work on a quarter crack. Glue-on shoes such as the Imprint thermoplastic shoes are allowed, as is Vettec's Equithane. 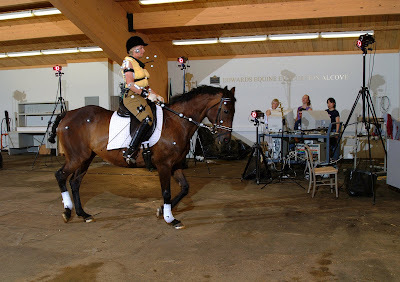 Part of that test involved determining if the horse was sound. "You have to take the horse out and judge if its sound or lame. You have to declare it. That after you declare it, the judges trot it to see what they think of your evaluation." The Associate level is designed to test a farrier's ability to do referral and/or therapeutic work. In the paper "So You Want to Be An Associate", Simon Curtis FWCF writes: "They are looking for you to convince them that you have a depth of knowledge of anatomy, conditions and diseases of the foot, and how conformation affects the gait and the foot, and vice versa. You need to show traditional forging skills and be able to apply them to an individual horse. You need to show a range of shoemaking skills in different materials including fabricating. "They are assessing your ability to think on your feet when confronted with a task that you might not have experienced. You need to be able to use and have an opinion on the modern materials listed. You need to be comfortable looking at x-rays and assessing a horse with a veterinary surgeon. "The above list of skills is quite wide ranging. However, it is only what one would expect a farrier engaged in remedial or consultancy shoeing to possess. The veterinary examiner is looking to see if you could partner him in treating farriery related conditions. The farrier examiners are looking to see whether they could refer a case to you." Laverty takes great pride in teaching students farrier skills at Kwantlen's nine-month course. He joined Kwantlen in 2003, bringing with him 30 years of industry experience and added his name to the impressive list of faculty at Kwantlen that has included Hank McEwen and the late Cindy Dawn Elstrom. Gerard’s career began with a three-year apprenticeship in Dublin, Ireland, with the Irish Horse Board. He graduated with a gold medal in both theory and practical skills. Gerard moved to the U.S. in 1981, then immigrated to Canada and began a business in Prince George, British Columbia. The Worshipful Company of Farriers offers one examination above the Associate, called the Fellowship (FWCF), which is the highest qualification from the company and perhaps the most difficult farrier examination in the world. Farriers with this qualification have the highest level of farrier knowledge and skills, and must be able to present their knowledge to an audience in a lecture or paper form similar to a masters thesis. For more information about the Kwantlen farrier program, please visit: kwantlen.ca/trades . You can also email Gerard Laverty or call him at 604.599.6177. Update: Final plans will be announced in the next day or so about a memorial service to be held in Gordonsville, Virgnia, most likely on Saturday, January 3, 2009. Arrangements are being handled by the Preddy Funeral Home, 301 N Main St, Gordonsville, VA 22942. The closest airports are Charlottesville and Richmond. Thanks to David Watson for the information. If you are in the farrier profession in the eastern United States, you probably know who I am talking about when I just say "Mr. Watson died". 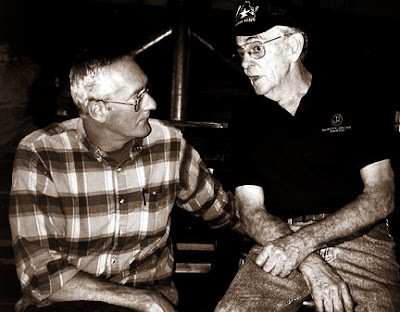 Edgar Watson, known respectfully as "Mr." and affectionately as "Eddie", lived in Keswick, Virginia and was one of the great "living legends" of not just the farrier world, but the horse world as well. He will long be remembered for the champions he shod, the beautiful artistry he created at the anvil, and the stories he told, but mostly will be remembered for his gentle manner and his willingness to help and encourage all of us, in whatever we tried to do to better our work or our horses' care. For the past ten years or so, Mr. Watson was chronically ill with a list of ailments that would have been the end of any normal human. He kept coming back and even ordered himself a brand new shoeing rig recently...when he was 80 years old. He began shoeing horses professionally in 1948. Follow this link to an album of photos of the appreciation day held for Mr. Watson in 2007, when he was diagnosed with cancer of the colon. Thanks to the Virginia Horseshoers Association for posting these photos. And here's a second link to a few photos of his fantastic shop. I will add to this post when I know more; thanks to Steve Mayer for letting me know. If you have a kind word to say about your friendship with or memories of Mr. Watson, please click on the colored link word "comments" at the end of this article. A new window will open up and you can leave your message. It will default to "anonymous" unless you sign it, and that's fine, but just include your name in the comment if you want to be identified. You can also email a comment to "blog@hoofcare.com" and I will post it for you. Update: The latest word is that a memorial service is planned for Saturday, January 3, 2009. Mr. Watson, right, talking to Danny Ward, left, sometime in the last 20 years or so. Click on the screen to launch the video. "How's his blood?" "Did you check her blood?" Questions like those might be the new mantra of racehorse owners when questioning a trainer before a race. Colorado State University researcher Dr Wayne McIlwraith is bullish on the reliability--80% accuracy, he claims--of a blood test developed in his Equine Orthropaedic Research Center. This video is a good introduction to the concept of a blood testing protocol in the bigger picture of breakdown prevention. The blood test will certainly not replace good horsemanship and monitoring of routine soundness and training issues, and there's no indication yet of what the test would cost, but this is a good news video for the holiday season. Tests like the CSU protocol will do nothing to help accidents like the horrific death of a runaway filly at Aqueduct racetrack in New York last weekend. Nor will it help horses who go down from clipped heels or other stumbling upsets, starting gate mishaps or any number of accident-type situations that can happen in a race. It's not clear how often racehorses would need to undergo the blood screening, or if McIlwraith would recommended that this test be a requirement for entry in a race. Breakdowns frequently occur during training sessions, although the public only sees the ones broadcast on television. But I hope that the racing world does embrace this glimmer of hope, that it is found to be predictive, and that this is a legitimate step in the only viable direction left for racing: up. Up with horse welfare, up with safety, up with preserving the excitement and vitality of a great sport. They should name it the Eight Belles Test. Passing the Eight Belles test would be a good thing. Click here to download a pdf file of an article explaining more about the test, written by Andrea Caudill. This article appeared in the October 2007 edition of The American Quarter Horse Racing Journal, and is also posted online by the Grayson-Jockey Club Foundation. Click here to download a PDF file of Dr. McIlwraith's recommendations for reform of racing to improve horse safety, as presented to a Congressional subcommittee in June 2008. Thanks to ZooToo for sharing this video. Please click to launch the automatic slide show. 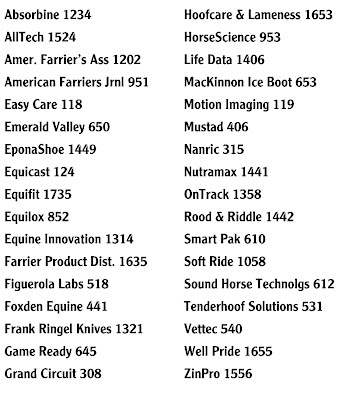 The Farrier Conference at the American Association of Equine Practitioners Convention in San Diego wrapped up last Wednesday night at a "meet the speakers" reception that included some key figures in the world of hoof research, education, and innovation. All farrier conference attendees were invited to the reception. Many of the people reading this blog have been the beneficiaries of the hard work and even harder thinking that the men and women in the room that night have brought to the art and science of caring for horses' hooves. It was an honor just to be in the room! The conference was moderated by Dr. Steve O'Grady, who somehow escaped the camera, as did speakers Jay Merriam and Ian McKinlay. Thanks to everyone who had anything to do with the conference, especially John Suttle, who encouraged farriers to attend--which they did! The audience was an interesting mix of vets and farriers, young and old, from all over the country--and the world. More reports from the AAEP Convention will be posted as they are completed. I hope these shoes fall within the parameters of the model rule for toe grabs and traction devices. Would you classify this as a rim shoe? All we talk about around here is the weather, it seems; the forecast is for more ice and frozen rain here in New England. There is a storm predicted to hit here every two days for the next ten days. For those of you unfamiliar with US news, the northeastern corner of the USA, where I live, is a tangled mess of frozen, solid and increasingly immovable debris. The worst ice storm in a century has changed our landscape forever. I wonder if we will ever trail ride again! There will be a lot of work to clear pastures, let alone trails. Well-known farrier John Blombach told me tonight that the roads are so blocked where he lives that they literally plowed the treetops, branches, telephone poles, and power lines out of the roads. There are no ambulances, no firetrucks, no open stores. A tree went through the roof of the porch of John's lovely old house, and another through an upstairs window; he was coming and going through the cellar. But he has a generator now, and lights, and he sounded very upbeat. Southern New England Farriers Association President Garth Bodkin lives on a beautiful lake in central Massachusetts. He said he has trees "all over the place" and no power. It took him three calls to get through but he too was upbeat; as John said, "No matter what happens, it can't get any worse." Farrier/microbiologist Shirley Fraser of Pepperell, Massachusetts, had been out using her truck for friends who needed to get water to their horses. She may be in great demand: she was hitching up her Percheron to "go move some trees around". Only one of the farriers I heard from today has had power restored, and that was Allie Hayes of HorseScience, who lives about 25 miles from here. She rehabs wildlife, in addition to makeing leg models, and I wondered how she was coping. The key to her business is a huge freeze drier that she uses to prepare her hoof specimen; it runs on electricity. I was envisioning a big defrost event, but luckily I was wrong. "The cold weather was my friend and there was no damage to product in the dryers and they survived the outage and are up and running again." she wrote in an email today. "We got power back some time in the wee hours Monday. I was up at 3 a.m. restarting the freeze-dryers." Over in New York state, things were pretty bad in the Saratoga area, and it sounds like Troy was hit particularly hard. In many communities, schools are closed until sometime in January. (A good thing, since people are living in the gymnasiums.) Some people may be without power until the end of the year. 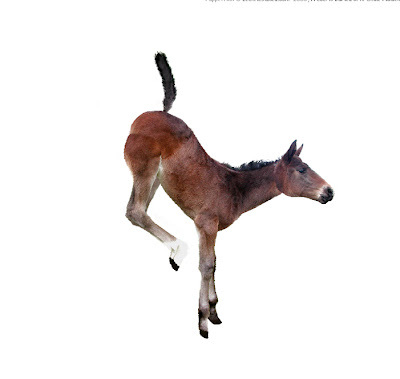 This image was entered in the "Photoshopped Horses" contest at Freaking News, and brought to my attention by theequinest.com. I hope to show some of the others in the days to come. This one is by Michael Bendler of Seymour, Connecticut. I hope he won! Is there a miniature horse on your Christmas gift list? What do you give the mini who has everything? People who own minis seem to love to dress them up, but the hooves are usually overlooked. Not any more! I recently came across a great Mustang therapy horse. 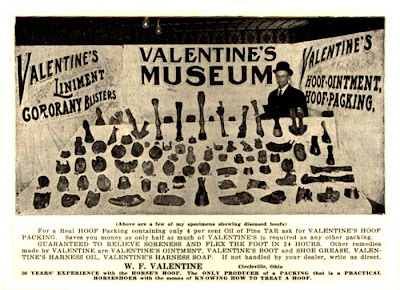 The multi-talented Nevada Joe is worthy of a blog story in his own right, but of course his "Mini" sidekick, Doc Holliday, stole the show...because of his feet. Doc Holliday, like my friend the three-legged Molly the Pony, makes bedside calls at hospitals; he's particularly popular at veterans' hospitals. The problem is that his hooves are noisy and they slip on the shiny hospital floors and, let's face it, the hospitals may have a point about his feet not being very sterile. I found out that Doc Holliday wears tiny hoof boots that silence his clip-clop to a whisper, prevent him from slipping, and satisfy a hospital's sanitary policies. Three problems answered in one hoof boot! And they look like human athletic shoes! Now, you may wonder, what high-tech design has been put into production to keep Doc Holliday trotting from bed to bed. And how much, exactly, do these therapy pony / sanitation booties cost? We all know the latest designer hoof boots can cost over $100...each. So I held my breath. And let out a good laugh. Doc Holliday's booties cost a whopping $8 each and you can stuff some mini's Christmas stocking into a bootie next week, too! The boots are actually made for Teddy bears, and are sold on the Build-a-Bear web site. 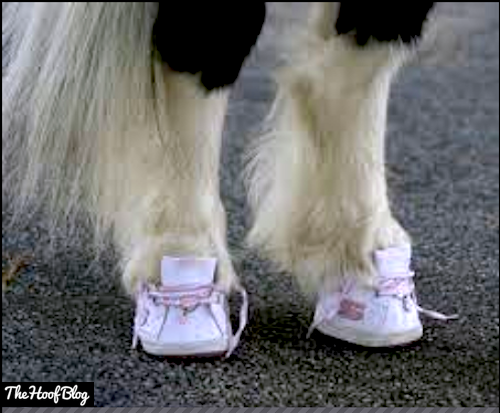 For some reason, they fit right onto a mini's hooves, and stay on through the session, according to Doc and Nevada Joe's enterprising handler, Diane Purcelli. They come in pink glitter, too! Learn lots more about Nevada Joe here, and Doc Holliday here. You just might run into them; they are making the circuit of the Equine Affaire-type expos around the country, sponsored by Wahl clippers. These are two of the most interesting horses I've met in a while. I don't know how many Mustangs are working in therapy programs, but I know that Joe is a pretty good mounted shooting horse, and that the handicapped children in the program now have a balloon-popping game they can play on horseback during their sessions. I hope you will read about this horse and the work he does. And remember the $8 hoof booties when you're in a bind with a mini or a foal and need a hoof boot. Just don't tell Build-A-Bear why you're ordering them or the price will go up! Thanks to Diane for her time this week while she is competing at the World Series of Mounted Shooting at the National Finals Rodeo in Las Vegas. She stopped everything to talk about Teddy bear boots! There must have been something in the water. Or maybe it was in the tequila. But the American Association of Equine Practitioners (AAEP) Convention, held in San Diego, California, last week was an escapist's dream. Five days of lectures, a huge trade show, a beautiful city, great food and drink, but most of all, a collection of interesting people from all stripes and ranks within the horse health and husbandry worlds made last week one of the most memorable conferences I've attended. They streamed in and out of the Hoofcare and Lameness booth: veterinarians, farriers, vet techs, practice managers, hoof trimmers, educators, researchers, therapists, chiropractors, authors, journalists, photographers, artists, spouses, ex-spouses, significant others, old friends, new acquaintances and even a Dachshund from Arizona. Seldom was heard a discouraging word. I hadn't expected the convention to be so upbeat. I flew in from the land of gloom and doom, where falling real estate values and collapsing stock prices have convinced everyone that the End is Near. I wasn't expecting people to be generous and supportive and so very friendly. What a wonderful surprise! I would like to thank everyone who visited the booth, everyone who worked so hard to present their finest information and images from the stage, and especially the AAEP for hosting this event in the right city for this year. Warm and sunny and relaxed was the perfect recipe. Special thanks go to our friends at Vettec for sponsoring our California-themed "Hoof Dude" unofficial convention guide. It had tips and schedules designed just for people who were interested in hoof-related information. The AAEP again hosted a sub-conference for farriers. I can't estimate how many farriers were there because, as was the case in San Antonio, a lot of the people in the lecture hall were vets, which is encouraging. I did see a lot of farriers in the trade show, and met some from California that I might otherwise never have known. Special thanks to everyone who came up and opened a conversation with the kind words, "I read your blog every day!" and especially to the one who said, "I check your blog before I eat breakfast." The AAEP convention is the end of the conference year. It is the single biggest and most expensive event on the Hoofcare and Lameness calendar each year, and it is often difficult to pull it off when it is a few days after Thanksgiving, or when the trade show budget is being scraped as clean as a cookie batter bowl. In December 2009, the AAEP travels to Las Vegas for the first time, where it will share the big bright city with the National Finals Rodeo (NFR). Hoofcare and Lameness already has a booth reserved. My red-eye flight home landed in Massachusetts just a few hours before the worst ice storm in recent history hit the region. I feel a bit of survivor guilt, since the storm was mostly rain here on the coast, although the power did go out and is still out just a few miles from here. People are in the dark in their cold houses tonight as I write this. It seems impossible that I could have been standing under a palm tree just a few days ago. I hope I can share with you some of the rays of sunshine that spill from my notebook, even if it is hard to type with gloves on. Please keep the cold New Englanders in your thoughts, especially those who can't and won't leave their animals to get to a warm, safe place. It's not warm here. There are no palm trees. But it's home. © 2008 Fran Jurga and Hoofcare Publishing. No use without permission. You only need to ask. German veterinarian Eva Krüdewagen learns to use the hoof lifter at a clinic in Germany. Dr. Hans Castelijns kneels at right. Photo by Loic Entwistle. 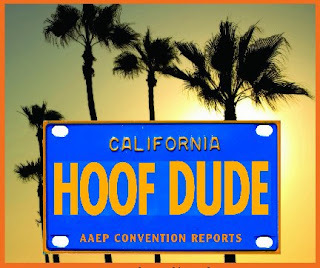 And now for something completely different: German farrier/veterinarian Hans Castelijns gave several lectures at the 2008 American Association of Equine Practitioners Convention in San Diego, California. 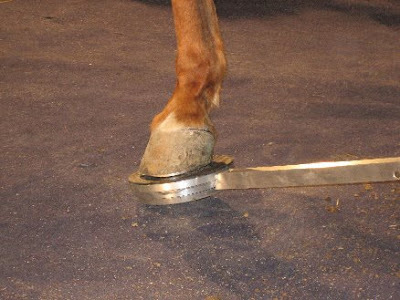 In a special session on lameness in the foot in Monday, he presented a tool that has, as yet, not hit the radar of American-style lameness diagnosis. Castelijns is a referral vet/farrier and runs a rehabilitation farm in the Tuscany region of Italy, when he's not harvesting his olive groves or traveling the world as a lecturer and thought-provocateur. His tool is a multi-level aluminum-encased disk that the horse stands on; the top surface is covered with a non-slip pad. A long lever arm extends from the center of the disk. 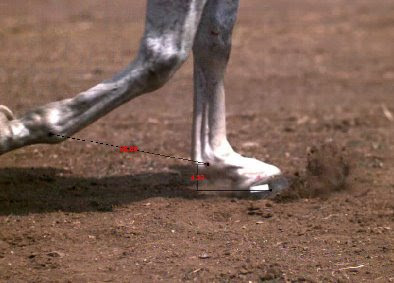 It cranks the disk up to displace medial or lateral, toe or heel, regions of the foot, to test for discomfort, or perhaps more precisely, to gauge the horse's range of comfort. 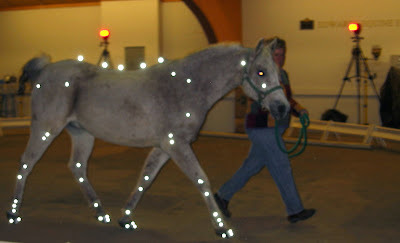 The horse protests when too much torque is placed on the foot, indicating ligament pain or general intolerance to uneven weightbearing. 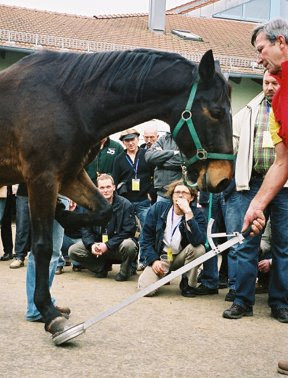 Swiss farrier Bernard Duvernay demonstrated the device at the wonderful Luwex HufSymposium in Germany in 2006. The lever arm has an angle gauge and a level at the end, so the operator can say, "Before we trimmed him, he had a medial intolerance at x degrees. With this new trim, he showed no intolerance at all." 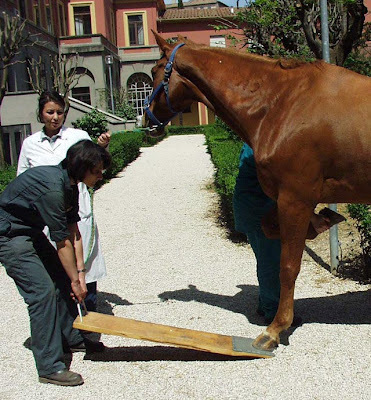 The tool is a massive sophistication of the basic lever test for navicular pain; veterinarians formerly stood horses on a board and lifted it, higher and higher to extend the coffin joint and stress the navicular zone, including the deep digital flextor tendon and the navicular ligaments, while an assistant lifted the opposite foot (see photo below). Horses with navicular pain shivered their upper leg muscles, jumped right off the board or buckled backward. The test was often dangerous for all involved; sometimes diagnostic tests would try to lift the foot from the side to elevate the lateral side of the foot, so that pain in the collateral ligaments might be identified. 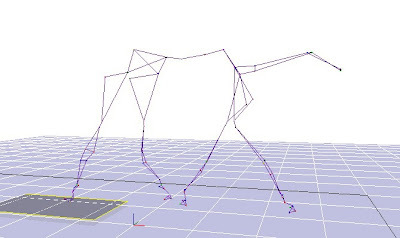 While digital extension tests with a board may not be very accurate in pinpointing the source of pain, they can be helpful, particularly in the field, and they are useful for before and after illustrations of horses reactions pre- and post-shoeing or trimming or surgery. Castilijns has developed a protocol for the use of the more sophisticated tool and also has pinpointed areas that he feels are sensitive to specific elevations. Castilijns's paper is published in the official Proceedings of the AAEP Convention. An older paper on the device is published in the English language section of his excellent web site. Click here to read the older paper. The device is sold commercially in Europe. A new study of laminitis at the Ohio State University College of Veterinary Medicine has been approved by the Barbaro Memorial Fund, which is administered by NTRA Charities and the National Thoroughbred Racing Association. Funds for the study will flow through the Grayson-Jockey Club Research Foundation. The new study, "Effect of Digital Hypothermia on Inflammatory Injury in Laminitis," by Dr. James Belknap, is a two-year project funded for $82,109. The study will examine the effects of extreme, isolated cold on the damage done to hoof tissue when laminitis damages the hoof wall's bond to the inner foot. Barbaro funds also will support two continuing projects: "Targeting 5-HT in Equine Laminitis," by Dr. Douglas Allen at University of Georgia and "Treatment of Equine Laminitis with Doxycycline," by Dr. Susan Eades at Louisiana State University. Both studies were funded with a $100,000 contribution from the Barbaro fund to the Grayson-Jockey Club Research Foundation in 2007; an additional $8,692 completes the projects in 2008. Both projects are on schedule to produce research papers in peer-reviewed scientific journals. The Barbaro Fund contributed an additional $60,000 in 2007 toward laminitis research projects and programs at the University of Pennsylvania, bringing its total disbursements to $250,801. A distinguished panel of equine veterinarians, assembled by the Grayson-Jockey Club Foundation, evaluated several proposals before making final recommendations on the laminitis studies. The panel included Dr. Larry Bramlage, chairman of the Grayson-Jockey Club Research Foundation; Dr. Johnny Smith, the Foundation's veterinary consultant; Dr. Paul Lunn, Professor and Head of Clinical Studies at the College of Veterinary Medicine and Biomedical Sciences, Colorado State University; Dr. Scott Hay, President of the Teigland, Franklin, Brokken veterinary firm and a specialist in equine lameness; racetrack practitioner Dr. Tom Brokken, also of Teigland, Franklin, Brokken veterinary firm (and a past president of the American Association of Equine Practitioners); Dr. David Horohov, the William Robert Mills Chair at the Maxwell Gluck Research Center, University of Kentucky; Dr. Gary Lavin, a retired race track practitioner, past AAEP president, and Vice-Chairman of the Grayson-Jockey Club Foundation; Dr. Rick Arthur, Equine Medical Director for the California Horse Racing Board; Dr. John Stick, Professor and Chief of Staff at the Large Animal Clinic of Michigan State University School of Veterinary Medicine; and Dr. James Orsini, Director of The Laminitis Institute, and Associate Professor of Surgery at New Bolton Center, University of Pennsylvania. Barbaro, winner of the 2007 Kentucky Derby, was euthanized while recovering from fracture surgery at the University of Pennsylvania's New Bolton Center. The horse developed laminitis, a common and often fatal complication of orthopedic procedures for some horses. The doors of the huge three-block-long San Diego Convention Center in San Diego, California will swing open today. The back doors, that is. The front doors will open bright and early Sunday morning, when an expected 5000 or so people will don their badges and head for the lecture halls. Those back doors open onto the loading dock. Cranes and cherry pickers and forklifts began today to prepare the giant hall for the trade show, which will host hundreds of "normal" trade show booths like Hoofcare Publishing's usual how-much-can-we-cram-in-100-square-feet displays. It will also be home to the colossal mega-island displays of the pharmaceutical companies and major veterinary product distributors. Each mega-booth has a squadron of salespeople in identical shirts (Pfizer is blue, Merial is green, etc.). The cost of the design and fabrication of one of those "booths" is equal for an entire veterinary student's multi-year tuition, I'm sure. Or more. It will take the exhibit company three days to build the trade show. Some of the exhibits are three stories high...and revolve! Those revolving corporate logos in the trade show sky become helpful landmarks to find your way around the vast space. Finding time to see all the booths will be a challenge with all the great seminars going on! This year's AAEP convention offers a half day program on lameness each day, including one on laminitis on Tuesday, foot lameness on Monday, and an all-day farrier conference on Wednesday. (My guess is that the farrier conference will be standing-room-only again, as it was two years ago in San Antonio, not because of the farrier attendance, which will be high, but because so many veterinarians want the information to be presented.) I've counted about 50 lectures that will be of interest to anyone working on horses with foot or leg problems. Here's a list of some of the small to medium sized companies to look for in the trade show. Maybe next year we'll have moved up to a mega-island architectural statement but I don't think there are any unique colors left for staff shirts! Yes, there are 18 rows of booths, with about 40 normal-sized booths in each row. You can do the math and see how big this show is...and why you need a treasure map to find the little booths with the hoof information and products! "While pre-registration has ended, as of (November 19) the number of pre-registered attendees (DVMs, students, veterinary technicians and guests) for the meeting is the highest we’ve ever had for an annual convention," wrote AAEP Director of Marketing and Public Relations Sally Baker in a memo to the press three weeks ago. "This is certainly good news in light of the current economic climate. We will also have on-site registration." Go to www.aaep.org/convention.html for more details. And come find us! When New Zealand apprentice farrier Brian Cameron puts down the last horse's hoof at the end of a day of shoeing, he puts his own foot in the stirrup and starts schooling his show jumpers. Brian was recently awarded the title of National Senior Apprentice for his achievements with his mentor, senior farrier Jock Good. This article is not just a good view of a hardworking young farrier who wants to excel; it offers insight into the New Zealand system of farrier training, which I have always thought was very good. THey not only have a system for apprentices with college training, but also offer continuing education courses with credits for working farriers--or at least they did when I was there. You might see Brian Cameron in the farrier competition tents soon--or in the show jumping ring. He seems set to succeed in both arenas! Click here to read about Brian and the farrier training system in New Zealand, as published today in the Taranaki Daily News in New Zealand..
Brian seems to be following in the hoofprints of show jumper Bernard Denton, who didn't make the Kiwi show jumping team for Hong Kong on his high-flying jumper Suzuki, but as a consolation prize was chosen as the team's farrier! Dr. Eleanor M. Green will be recommended for appointment as dean of the Texas A&M University College of Veterinary Medicine and Biomedical Sciences, effective March 1. 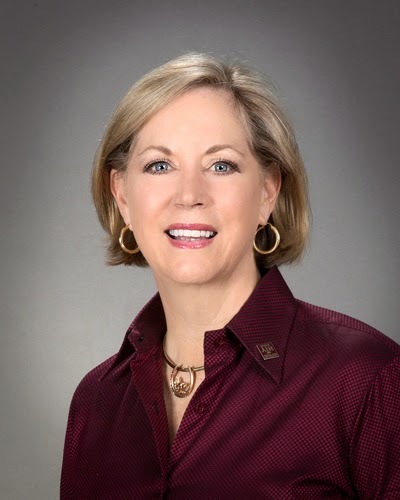 Her appointment will be presented to The Texas A&M University System Board of Regents at its January 2009 meeting. She would succeed Dr. H. Richard Adams, who is returning to the faculty of the Department of Veterinary Physiology and Pharmacology. The red line on the thermometer is dropping. The blankets are out. The feed bucket gets an extra half a scoop. Soon it will be an extra whole scoop. Or two. In the deluxe barns, the heat comes on. "Can you bring the horses in early tonight? It's awfully cold...and make sure Bilbo has both his blankets on, ok?" And when laminitis strikes, horse owners run through a gamut of emotions, from grief to guilt to an outpouring of excessive care and nursing. When, in most cases, it could have been avoided. In this post you will find a three-part video from World Horse Welfare (formerly the International League for the Protection of Horses), a British-based charity that puts laminitis very high on its list of educational priorities. World Horse Welfare horse care team leader Samantha Lewis shares good practical information with a horse owner in this video. She talks about the risks of laminitis, winter grazing, blanketing, weight taping, and a lot of other key concepts for horse owners. She had my attention from the very first sentence: 80 percent of horses in Great Britain are overweight. How can that be? When she examines horses of different sizes and conformations, I start to understand that weight is a very deceptive variable in horses. And I may have been guilty of misjudging some horses in the past, according to Samanta's system. I hope the regular readers of this blog will refer horse owners to this post to learn about the relationship of weight to laminitis and other health problems. If you're a vet or farrier, please recommend these video clips to your clients. NOTE: In the shaded portion at the end of this blog article, you will see a small icon that looks like an envelope. If you click on it, you can forward this article (or any article in the entire archive of the Hoof Blog) to anyone you'd like to have this information. I think that the email icon shows up in some browsers and not others; sorry for this inconsistency. This video set might make a great Christmas present instead of a bag of horse cookies. Thanks to WHW for making these clips available. 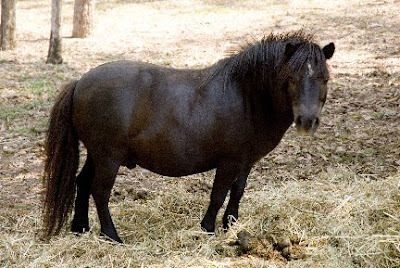 There's lots more information about obesity in horses on their website. For information about laminitis, please visit Dr. Chris Pollitt's laminitis research web site. © Fran Jurga and Hoofcare Publishing. No use without permission. All images and text protected to full extent of law. Permissions for use in other media or elsewhere on the web can be easily arranged. Fran Jurga's Hoof Blog is a between-issues news service for subscribers to Hoofcare and Lameness Journal. This blog may be read online or received via a daily email through an automated delivery service. To subscribe to Hoofcare and Lameness, please visit our main site, www.hoofcare.com, where many educational products and media related to equine lameness and hoof science can be found. Questions or problems with this blog? Send email to blog@hoofcare.com. Comments to individual posts are welcome; please click on the comment icon at the bottom of the post.